The growing season in Colorado varies between mountain regions, semi-arid desert and warmer valleys. Tulips (Tulipa spp.) are hardy and versatile, with different varieties growing well in U.S. Department of Agriculture plant hardiness zones 3 to 8. Across Colorado, plant tulip bulbs in September or October, at least six weeks before the ground freezes and when the ground temperature has cooled to 55 degrees Fahrenheit. The bulbs need enough time to root in order to ensure they will flower in the spring and so that they will not be pushed out by freezing and thawing. Planting too early may confuse the plant, causing it to grow top growth rather than roots. Planting too late will not allow the bulb to root before the ground freezes. U.S. Department of Agriculture plant hardiness zones across Colorado range from 3 to 7; most of the central part of the state falls in USDA zone 4 or 5, while the western slope and southeastern Colorado are in USDA zone 6 or 7. Choose a tulip variety best suited to your climate, taking into account the micro-climates on your property. For example, bulbs planted against a sheltered south-facing wall will send forth shoots earlier than those planted in a more exposed location. The early growth can withstand early spring frosts though temperatures below freezing may burn early-blooming flowers. Plants that consistently emerge when late winter or early spring temperatures drop below freezing may suffer permanent damage. 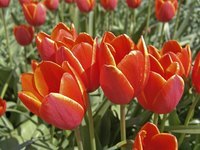 Like most bulbs, tulips require 16 to 18 weeks of cold in order to flower. Cool temperatures stimulate a biochemical response that induces the flower to develop. If the cold period is too short, flowers may emerge but will not be fully developed. Purchase bulbs early in the fall for best selection and store them in the refrigerator or other location at 35 to 45 degrees Fahrenheit until planting time. As a general rule, in mountainous regions of Colorado within USDA zones 3 to 4, plant tulip bulbs in September; in warmer areas of Colorado in USDA zones 5 to 7, plant in October. Tulips grow best in sandy loam with a neutral pH of 7.0. In Colorado, amend heavy clay soils by replacing up to one-third of the soil volume with sphagnum peat moss or decomposed compost. Apply a 0-46-0 phosphorus fertilizer at a ratio of ½ pound per 100 square feet. Mix fertilizer into the soil 3 to 4 inches below the planting depth to avoid burning the roots, and be careful not to compact this soil layer below the bulbs. Plant tulip bulbs with the tip upward at a depth that is four times the height of the bulb from the soil surface to the bulb tip. Space bulbs 4 to 6 inches apart -- five to nine bulbs per square foot, depending on bulb size. Water well so that water reaches the bulbs at the root level and settles the soil around the bulbs, to prevent cold, dry air from reaching them over winter. Mulching with 3 inches of organic matter will maintain a more consistent soil temperature and will also prevent moisture loss when the ground is not covered with snow. Once planted, you should not have to water the bulbs again until spring. Squirrels, chipmunks and other rodents may find your tulip bulbs the most delectable food source in their range. Since these animals naturally dig to find and bury food, tulip bulbs can be an attractant. Installing a 1-inch wire mesh wrap around the tulip bulbs while planting may deter squirrels -- though to guarantee they cannot reach the bulb, you need to encase the entire planting bed in mesh.